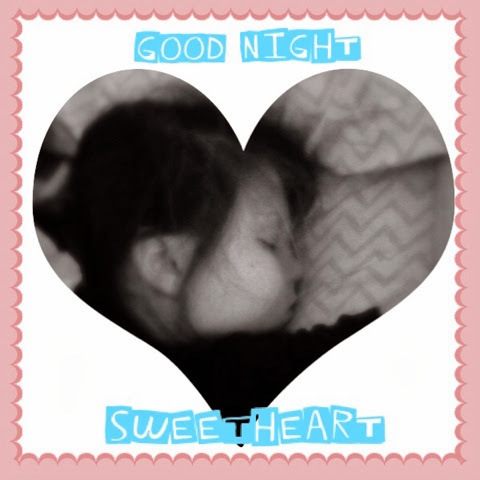 Wednesday, February 5th: Goodnight sweetheart! Sweet dreams! Thursday, February 6th: Today I was subbing at the kids school and there was a chance we could get some snow so they decided at 1:30pm we would get out 2:30pm! I would say everyone is still just a little anxious since the last snow storm and being a little cautious but that's ok with me! 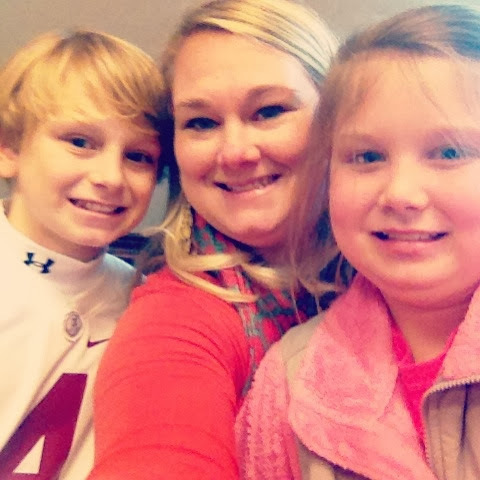 After last week I was more than happy to be at the school with them and know what was going on! 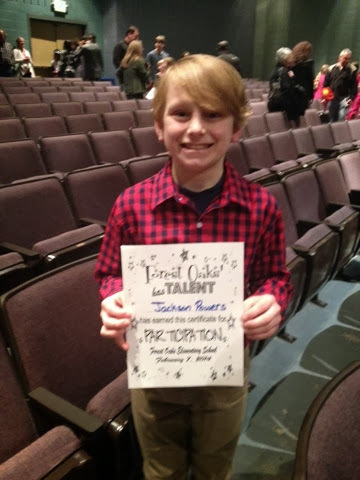 Friday, February 7th: The school had a talent show and Jackson was one of the emcees for the show! He did a great job! Proud mama moment! 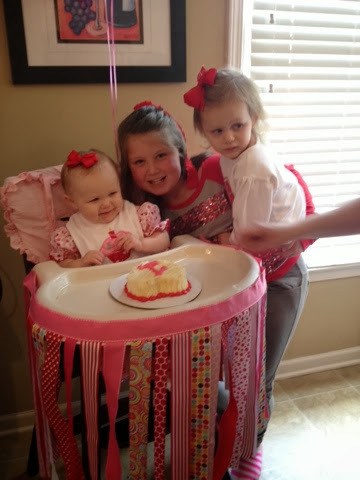 Saturday February 8th: Brylee and I got to celebrate my BFF Katy's little girl sweet Maggie's 1st birthday! This little sweetheart turned one! Can't believe it has been a year since I got a text at 5:30am on a Sunday morning saying I'm in labor!!! Fun times! ;) The birthday girl with her big sis Burkleigh and Brylee! 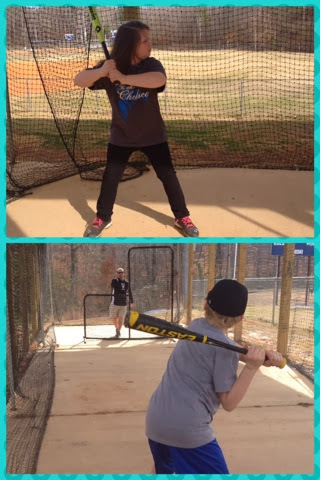 Sunday February 9th: we went to the softball field after church for some family fun! Brylee is playing softball this year and Jackson is playing baseball! That is code for busy ball park mama! 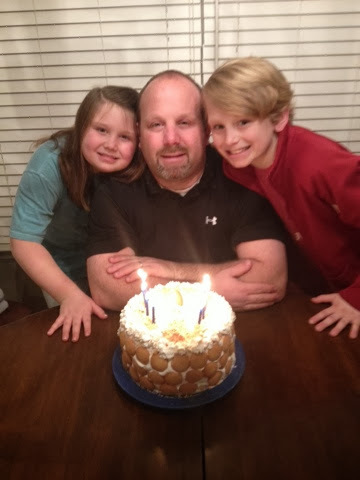 Monday February 10th: happy birthday daddy! Due to an ice storm that was predicted for our area and basketball practice we decided to stay home instead of go out to eat! We grilled out steaks and had baked potatoes and salad! I also made him a banana pudding cake! He usually always gets banana pudding for his birthday "cake" and we saw a recipe for a banana pudding cake on Facebook a few weeks ago so I found the recipe on Pinterest and attempted it! I must say I am pretty proud of myself and the birthday boy gave it two thumbs up! Happy Birthday Daddy! 39 and holding!!! Tuesday, February 11th: We did not have school today because of an ice/snow storm that was predicted for our area! 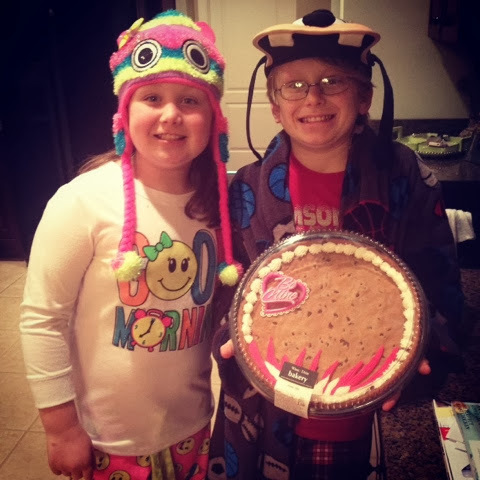 After being home all day the kiddos decided they needed a cookie cake for dessert and a late night visit to GoGo and Grandaddy's house! So that is what we did, picked up a cookie cake and took it to GoGo and Grandaddy's! Let me also add these two went into the grocery store to pick out the cake dressed in their PJ's and these crazy hats! Oh me Oh my! Silly Kiddos!